Synergy of powerful antioxidants and adaptogens for your morning ritual. Chaga is a tree mushroom that grows on the sides of trees – usually Birch, not in the ground. It is rich in compounds called adaptogens which boost immune function, physical stamina and mood. 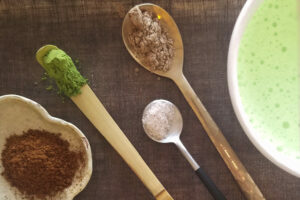 We’ve been adding it to our lattes at Matcha Box with a hint of cardamom and a pinch of salt. We call it ecstacy because of the calming euphoric effect of matcha’s L-theanine and chaga’s stress relieving properties. Steep 2-3 teaspoons of chaga powder in 8 oz. hot water for half hour, or more. The nutrients are water soluble and only released during steeping. Longer steep time yields more intense nutritional extraction. Strain if desired. The flavor is very neutral, almost like a mild broth. Combine all ingredients in your kitchen gadget of choice and blend well. Drink immediately. As always we use the term “recipe” lightly here and encourage you to find your own latte rituals.